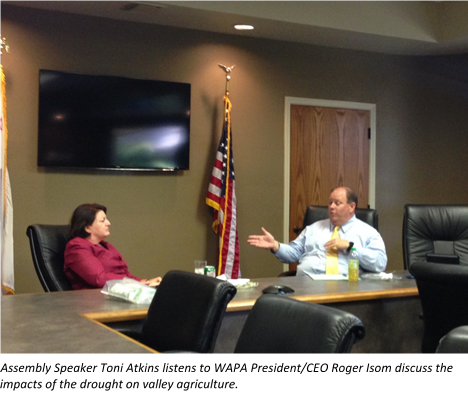 The Speaker of the Assembly in the California State Legislature Toni Atkins was in Fresno, and took time out of her incredibly busy schedule to visit the Association’s office for a lunch meeting with a small group of agricultural organizations to discuss critical issues facing agriculture. The Western Agricultural Processors Association (WAPA) hosted the event. Other organizations involved in the event included the California Cotton Ginners and Growers Association, California Citrus Mutual, California Fresh Fruit Association, Nisei Farmers League and the American Pistachio Growers. As one would expect water dominated the discussion, with talk about the need for increased water storage and the situation in the delta as critical to helping solve the long term water situation in this state. Other matters touched on in the event included climate change, exotic pests, labor issues, transportation and the overall state of agriculture in this time of significant drought. Speaker Atkins has long been a friend to agriculture and we are appreciative she would take time to stop and visit us during her trip to Fresno. Speaker Atkins has previously toured the valley visiting an almond huller, cotton gin and operating a cotton picker. The Speaker will be termed out next year and is considering continuing her work in the State Senate. She currently represents the La Jolla, Pacific Beach, Mission Bay, Old Town, downtown, Coronado Island and Imperial Beach areas of San Diego.